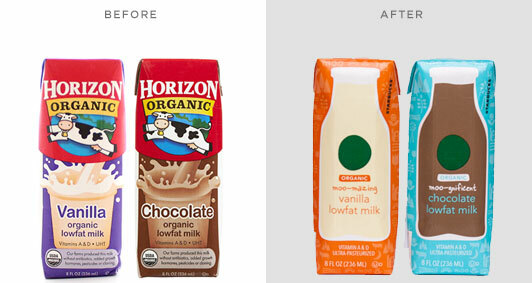 In early July, Starbucks introduced newly repackaged organic boxed milk in its stores. The old Horizons brand with its leaping cow, has been replaced by a Starbucks design and branded container featuring bold colors, simple graphics, and the iconic green straw. 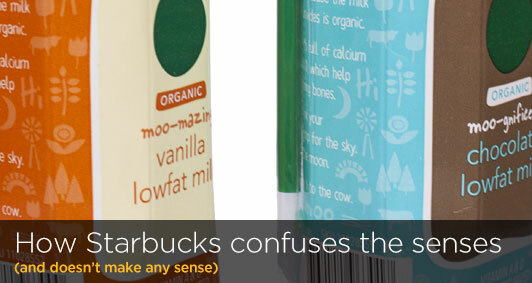 The new Starbucks milk packaging is simple yet whimsical, with a flood of bold color and subtle pattern of farm-related symbols. A large, old-fashioned milk bottle appears on the front, with a green circle (a simplified Starbucks logo?) and a playful attempt at naming the product: “moo-gnificent chocolate” and “moo-mazing vanilla.” The brand story appears on the side in a hand-written typeface. Overall, the design of these packages is well done. The problem, and what is most disconcerting, is the choice of colors used goes against all conventional wisdom (and proven research) regarding brand packaging, making the product a lot less appealing, and appetizing, to buy. The new milk cartons give off the wrong first impression. A product’s packaging is often the first interaction that a customer will have with a retail brand. According to a study commissioned by MeadWestvaco (Packaging Matters: Packaging Satisfaction Study), “when it comes to making purchasing decisions, the average consumer ranks a product’s packaging almost as important as [the reputation of] the brand itself (ten percent versus 12 percent).” In the case of Starbucks’ organic milk packages, they don’t look like milk cartons—the bright orange makes it look like it’s orange juice, while the blue box is reminiscent of blueberry or raspberries. When Coke introduced their white Polar Bear cans for Christmas 2011 (read more about this), not only did customers have difficulty finding the product on store shelves, they also complained that it tasted more like Diet Coke (presumably because the can looked similar). Packaging colors should correspond to flavor.